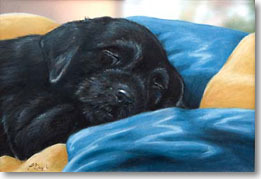 Labrador Retriever Gifts presents Lab dog Art, Clothing, Gifts and Collectibles; more than 2,000 Labrador products, in 20 categories. Online shopping guide, catalog for Lab Retriever lovers and for Labrador themed gift ideas. Black Labrador Gifts, Chocolate Labrador Gifts, and Yellow Labrador Gifts. Black Lab Gift Items, Yellow Lab Gift Ideas and Chocolate Lab Gifts and Accessories. You'll find unusual and unique gifts for Labrador dog lovers here, as well as personalized / customized Labrador themed products, fun gifts and useful accessories with a Labrador theme. Our products and other stuff can be shipped worldwide, international / USA and UK based stores. In our online shopping catalog and store you'll find Labrador Retriever Gifts, Labrador Retriever Art, Labrador Retriever Products, Labrador Retriever Stuff, Labrador Retriever Items, Labrador Retriever Accessories, Labrador Retriever Shirts, .... Yellow Lab, Chocolate Lab and Black Lab Merchandise - All Things Labrador Retriever! Labrador Dog Gifts for People. Yellow, Chocolate and Black Lab Christmas Cards, see our collection of dozens of Labrador Themed Holiday Greetings. 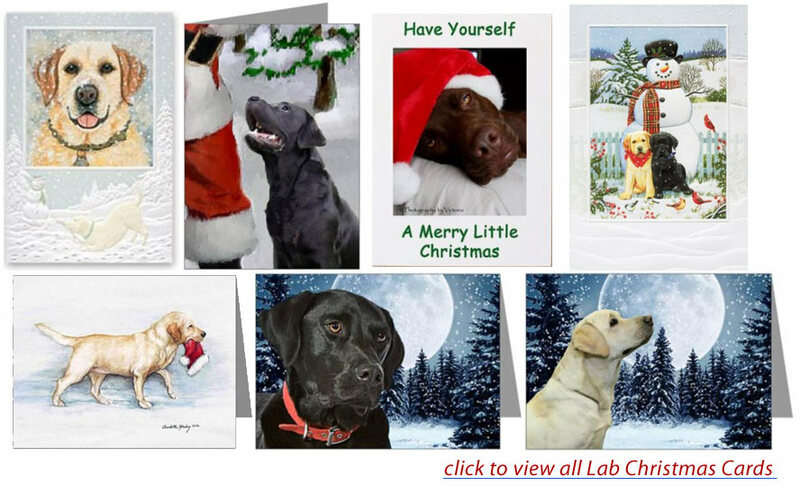 Labs with Santa Hats, tangled in Christmas Lights, Labradors in Sleighs, in the Snow, with Christmas Trees, Labradors meeting Santa Claus,... Cards featuring Yellow Labs, Chocolate Labs, Black Labs, Labrador puppies and adult Labrador dogs. Click to view our Labrador Christmas Cards. Yellow Lab, Chocolate Lab and Black Lab Christmas Ornaments and Holiday Decorations. Labrador Retriever Tree Toppers, Decorative Standing and Hanging Christmas Ornaments, Pillows with a Labrador Christmas Theme, Christmas Lights,... Christmas Decor featuring Yellow Labs, Chocolate Labs, Black Labs, Labrador puppies and adult Labradors. 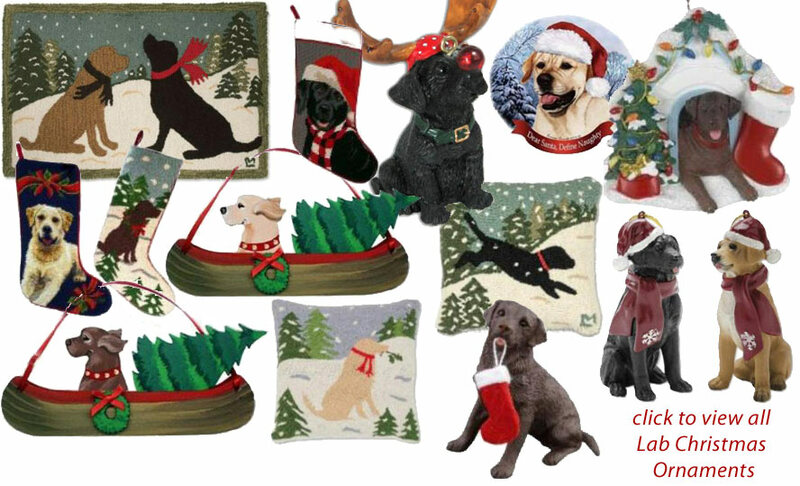 Click to view our Labrador Christmas Ornaments and Holdiday Decor. Labrador Calendars: Labradors of all coat colors pictured together, or just Yellow Labs, Chocolate Labs or Black Labs. Just Labrador puppies, too! Click to view our Labrador Calendars. Plush and stuffed Labrador dogs, Yellow, Black and Chocolate Labs to cuddle or collect. From small ones to large and up to lifesize stuffed Labradors: our collection features almost 100 different stuffed Labs. Other toys for Labrador lovers too, such as Labrador Retriever Jigsaw puzzles. 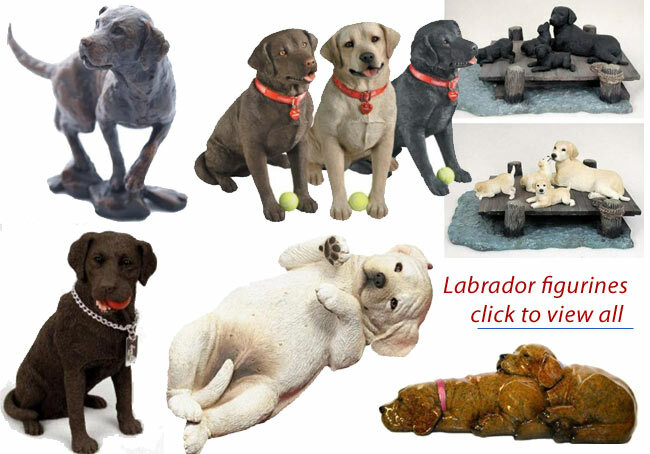 Click to view our Stuffed Labradors (and other toys for Lab Lovers). Labrador themed products for your kitchen. 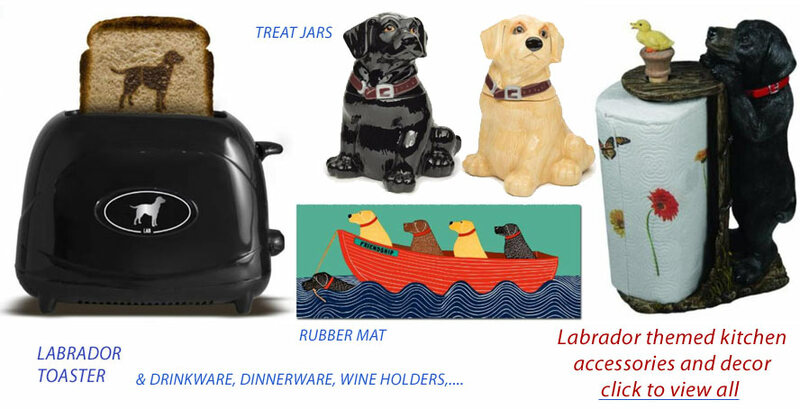 A Labrador Toaster, kitchen roll holders, salt and pepper shakers, before the sink runners (rubber mats), cookie and treat jars, mugs, glasses, aprons, dinnerware, tea pots, dish towels, & more ... Click to view our Labrador Retriever Kitchen Accessories and Decor. 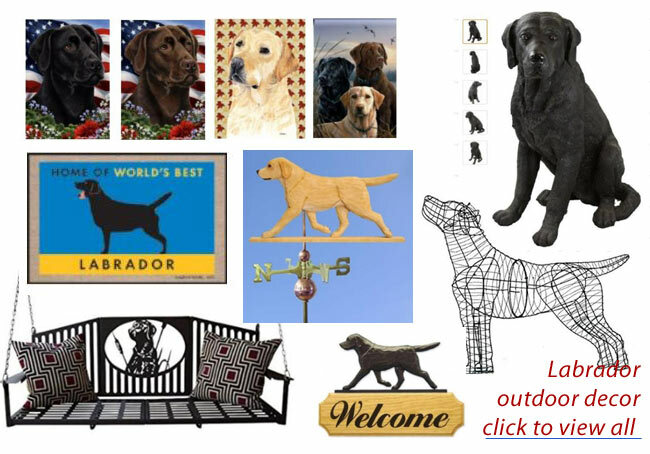 Yellow, Chocolate and Black Labrador flags, doormats, weathervanes, garden statues, a porch swing, welcome signs, fountains, & more ... Click to view our Labrador Retriever Garden & Outdoor Decor. Labrador Retriever Gifts presents Lab dog Art, Merchandise, Gifts and Collectibles; more than 2,000 Labrador products, in 20 product categories. Online shopping guide for Lab Retriever lovers, and for Labs themed gift ideas. Labrador Retriever Gifts, Labrador Retriever Art, Labrador Retriever Products, Labrador Retriever Stuff, Labrador Retriever Items, Labrador Retriever Shirts; Yellow Labs, Chocolate Labs and Black Labs Merchandise - All Things Labrador! Yellow Lab products, Black Lab products and Chocolate Lab Products. Labrador Dog Products. Yellow Lab, Black Lab and Chocolate Lab Merchandise. Labrador Dog Merchandise. Yellow Lab accessories, Black Lab accessories and Chocolate Lab accessories. Labrador Retriever accessories. Labrador Retriever Gifts and Collectibles (Collectables), Labrador Stuff and Lab Items. Gift Ideas for Lab Lovers. Birthday Gift Ideas. Little gift (small gift, cheap gift) for Labrador dogs lovers. Exclusive gifts, personalized and customized products. Labrador Retriever supplies. Yellow Labs (Golden), Chocolate Labs (Brown) and Black Labs. Gert Wiersma Uitvaartverzorging, betaalbare en persoonlijke begrafenis of crematie.